While Halloween may be on Tuesday, for some of us, the real treat comes Wednesday, when Halloween candy goes on sale. It can be pretty tempting to go ham on those Reese's pumpkins, because they’re just so. dang. good. But there’s a downside to this candy free-for-all: studies now suggest that sugar, not necessarily fat, is what contributes to weight gain. According to the Cleveland Clinic, the average American eats 152 lbs of sugar and 146 lbs of flour (which, of course, is broken down into sugars) per year. YIKES. It’s a safe bet that most of us are unknowingly consuming significantly more than the recommended amount of added sugar. And all this sugar can lead to numerous health issues: obesity, diabetes, liver problems, high cholesterol… basically, our sugar overload is killing us. That’s spooky. So while we don’t recommend putting a bowl of candy out on your desk (helloooo temptation to eat it all while working on that boring spreadsheet), it is okay to allow yourself a Halloween treat, as long as you keep it as just that: a treat. To help you make smart choices, we’ve rounded up nutrition info—calories, sugar, and gluten status for our Celiac or gluten intolerant babes—for some of our favorite Halloween candy. 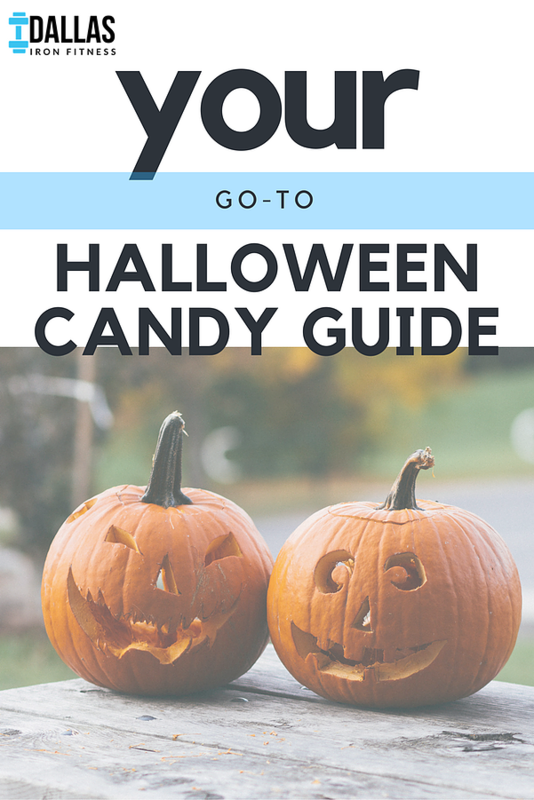 At the end of this post, find additional resources if you want to learn more about sugar, healthy fats, and a list of gluten free Halloween candy. Interested in a free month of online workouts?! Thought so. Keep reading to the end—we’ve got a treat for ya from Dallas Iron Fitness! Note: All nutrition facts are based on the “fun sizes” of these candies. Eat a treat for Halloween then start your November off right with Advocare’s 24-Day Challenge. Learn more about how you can head into the holidays feeling your best! And as an added bonus, we’re offering a free month of online workouts to anyone who joins Advocare’s 24-Day Challenge through Dallas Iron Fitness! Who’s ready to get fit?! With in-person and online home fitness training, we are ready to help you reach your fitness goals so that you can feel your best. Click here to your strength at Dallas Iron Fitness!